When we created this pairing of blooms bringing sultry shades of rouge along with pink and paprika, even we were surprised by the elegant blend of warmth and color it brought to the table. 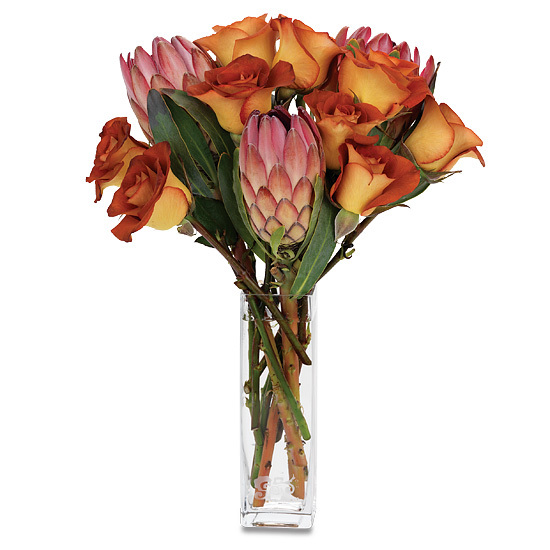 Large Cherry Brandy roses unfurl into beautiful bi-colored petals, while blushing protea lend a tropical air with their flowers resembling just-picked pineapples. Our signature glass vase is the perfect setting to complete the palette. Some varieties of flowers may look a bit tired upon arrival. Don’t despair! They’re healthy… just thirsty. They will rehydrate within 24 hours.